The City of Dover holds a state issued permit through the Department of Natural Resources and Environmental Control (DNREC) under Section 402 of the Clean Water Act: National Pollution Discharge Elimination System (NPDES) for its Municipal Separate Storm Sewer System (MS4). The NPDES / MS4 permit allows the City of Dover to discharge stormwater to waters of the state. Under this permit, the City has an obligation to take efforts which improve the quality of stormwater that runs off of our streets and into waterways, such as Silver Lake and the St. Jones River. Much of the pollution that ends up in our waterways comes from non-point sources, scattered sites throughout the watershed. Many of the things we do each day contribute to the pollution that ultimately enters our waterways. How we fertilize and maintain our yards, dispose of our pet waste, and wash and maintain our cars all affect the quality of the water that runs off of the land and into our water bodies. The City of Dover manages its efforts to improve the quality of stormwater while maintaining environmental compliance through a written Stormwater Management Plan (SWMP). The SWMP defines how the City will meet the requirements of its permit. A copy of our SWMP is provided here. In order for our residents / businesses to do their part a number of helpful resources can be found below. 1) Why is Stormwater Management Important? 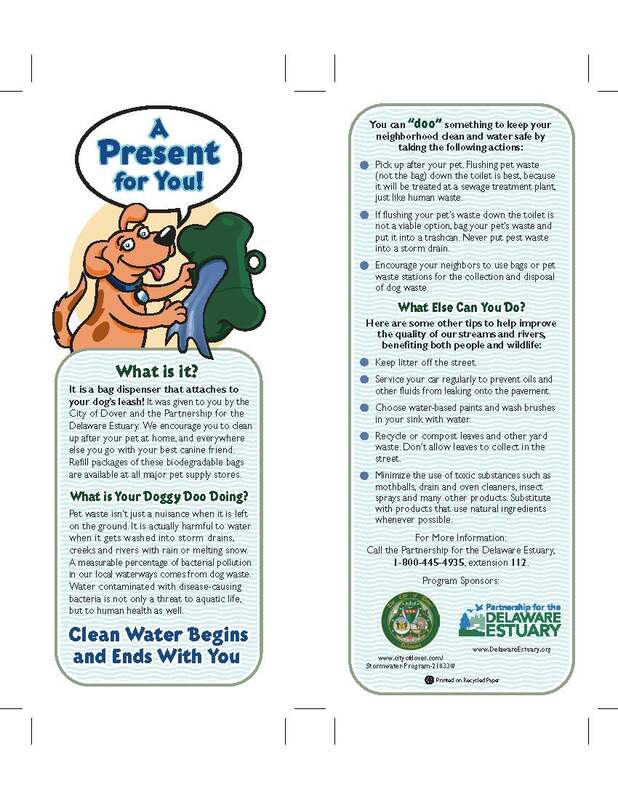 If illegal pollutants are found in your neighborhood, a door hanger will be placed at your residence to inform you about illicit discharges.An example of the door hanger can be found here: Illicit discharge door hanger . Don’t pour out household cleaners, garden pesticides, antifreeze, or oil-based paints.Instead, dispose of these items properly during a weekly collection at the Cheswold Collection Station . If you see someone discharging illicit waste into the storm sewer system, please notify the City of Dover: 302-736-7010 or idde@dover.de.us . Or in the case of an emergency notify DNREC Enforcement Crimes Hotline 800-662-8802. To help eliminate trash entering our waterways, please put trash and recyclables into designated containers and allow the city’s sanitation division to pick-up your waste. To find the trash/recycling pick-up day for your address please utilize the following links: Trash / Recycling . Follow the directions within each link. Below are a number of helpful links to other organizations that the City partners with. Through these partnerships we are reducing the amount of pollutants entering our streams and rivers through stormwater runoff. Review work by DelDOT on how they manage stormwater: DelDOT NPDES Publications . DNREC Division of Watershed Stewardship helps keep our watersheds clean by reducing nonpoint source pollution from entering our stormwater system. Create a healthy, natural lawn that reduces harmful pollutants in our streets and stormwater systems by joining: Delaware Livable Lawns . Plant native vegetation in your yard through: Delaware Native Plants . DNREC Sediment and Stormwater Program controls sediment and stormwater for the state of Delaware. Kent Conservation District helps conserve sediment and manage stormwater within Kent County. DNREC MS4 Program regulates municipalities in the state of Delaware with regards to separate storm sewer systems. EPA MS4 Program regulates the states with regards to separate storm sewer systems.